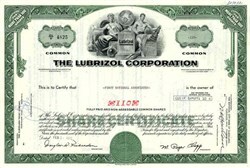 Beautifully engraved certificate from the Lubrizol Corporation issued in 1973. This historic document was printed by the American Bank Note Company and has an ornate border around it with a vignette of an allegorical man and woman each on opposite sides of a globe. This item has the printed signatures of the Company's President and Secretary and is over 39 years old. 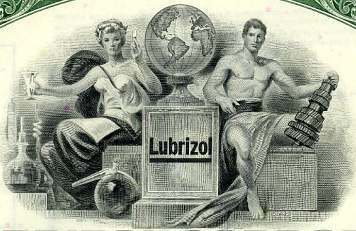 Lubrizol Corporation was founded in 1928 as a manufacturer of graphite oil products. Lubrizol is a recognized leader in specialty additives for lubricating oils. The Lubrizol Corporation is a global provider of specialty additives and fluid technologies. These high-performance technologies focus on chemicals, systems and services for transportation and industry. The company�s customers use its technology to enhance a wide variety of end-use products, including engine lubricants and fuel; gear oils and other vehicle-related fluids; hydraulic fluids and emission control systems; greases and industrial fluids; personal care products and industrial cleaners; paints, coatings and inks; and mining chemicals. Lubrizol was founded in 1928 and owns and operates 37 manufacturing plants in 16 countries. The Wickliffe, Ohio-based company has 53 sales and technical offices and more than 5,000 employees worldwide. The company had revenues of $2 billion and earnings of $91 million in 2003.